Are you looking at making the switch on your checking account because you’re tired of dealing with the hassles of fees and yet barely getting the service you expect? Do you do most of your banking online and hardly step into your bank’s branches? Simple may be a solution for you and your money. 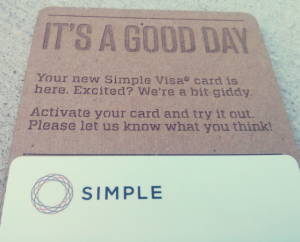 Simple has partnered up with Bancorp Bank to provide FDIC insured checking accounts for those looking for an easy to use alternative than the “big banks” which have gained a reputation for charging fees for providing some of the most basic banking services. What makes Simple special is how integral your smartphone is with your banking. You can use your phone to deposit checks, transfers money, and set up new goals. Simple also has some handy and intuitive tools to help you track your spending without counting all the pennies. Simple takes personal checking from being about just paying expenses and instead makes it a personal spending account with built in features that make it incredibly easy to save for short term and long term goals. Deposit/Send Money: It’s easy to deposit checks using your smart phones. Use their website to set up your bills and have them paid on time every time. You can also instantly send money to other Simple customers. Know Your Spending Balance: With our old bank, we would login to our account and see a balance, but it didn’t reflect any pending transactions, which can make it easier to overdraft on your checking account. Track Your Money: Forgot what you spent money on last month? You can use hashtags and photos with your notes, making it easier to search and sort through later. 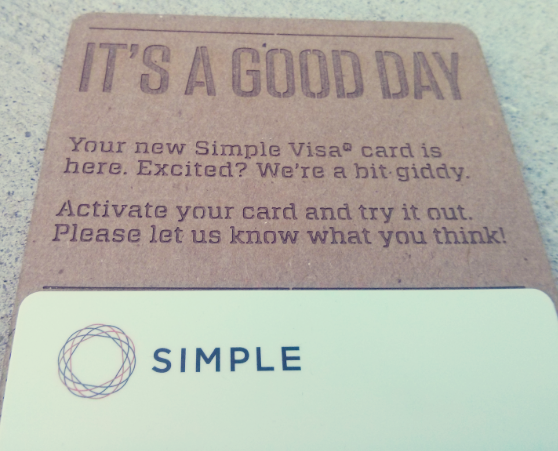 With Simple’s interface and automatic savings, you can being gently nudged towards reaching your goals. While it’s easy to pause on your automated deposits, you generally wouldn’t feel like it because you get to see your progress daily. Who doesn’t want to see their balance grow? You can write checks through the app, Simple will send a paper one to the recipients. One note: currently Simple is offering individual checking accounts, so if you’re looking for a replacement for your joint checking or savings, I’m going to suggest Capital 360 and Ally Bank. Simple prides itself on giving customers useful features and great service without charging ridiculous fees. There is no reason why you two should be working hard to pay the bills and save to get ahead just to have your bank drain your accounts with fees and needless services. The few fees listed are for services like expedited delivery and a paper copy fee (it’s free to view and print yourself). the one fee I’m not crazy about is the inactivity fee if you haven’t used your account in 180 days (~6 months). However if you’re using this for your personal checking account, it shouldn’t be a problem. Simple uses Allpoint’s network of ATMs, which currently boats over 55,000 locations nationwide. We first discovered the network through our joint bank, Capital One 360 and through the years, we have never had any problems getting to an ATM when we need to withdraw cash. If you’re looking for a checking account to get you into the mode of saving and building your financial cushion, Simple can be the answer for you. Do you want to sign up for Simple? I’ve got the hookup to skip their waitlist!